I remember way back in the day playing Fatal Fury in the arcade. It was my first time playing an SNK fighter, and I found it different from the Street Fighter 2 I’d been playing, but I really enjoyed it. Soon after I got Samurai Showdown, Art of Fighting and eventually King of Fighters. 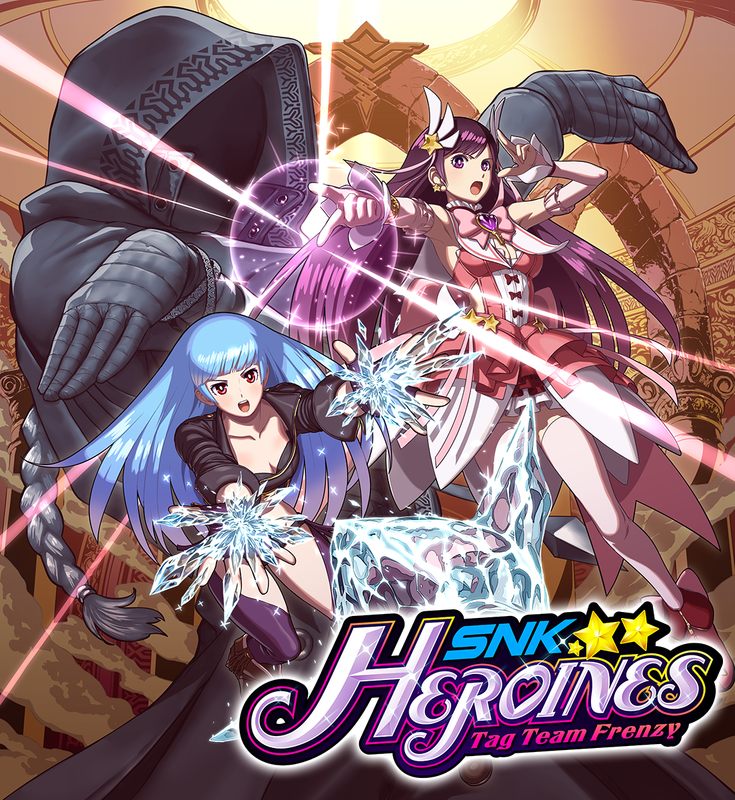 As you’ve probably guessed by now, I know quite a bit about SNK fighters, and when I saw SNK Heroines: Tag Team Frenzy for the first time I had a WTF reaction. This is way different from anything else they’ve done before. When they explained they were doing a simple fighter with a kinda silly story and lots of fan service, I was like “I have to check this out”. Let’s see if this over the top fighter with the SNK gals delivers. Taking place several days after the previous The King of Fighters tournament, some of the female participants have suddenly fell into a deep sleep. The girls awake to find themselves in some rather revealing and strange clothing in a bizarre mansion. 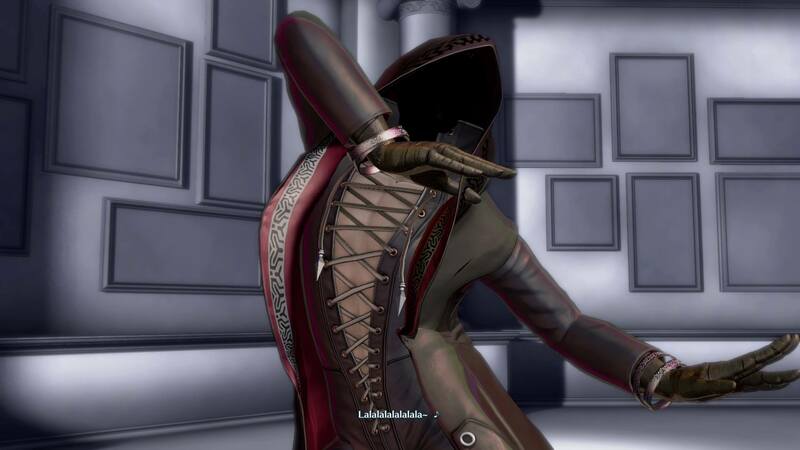 The girls will have to fight their way to the mysterious boss of the mansion that strangely resembles Kukri. If you go into this expecting a deep and powerful story about the SNK ladies overcoming the odds to escape their capture, you’ve come to the wrong place. The story here is very lighthearted and silly. Kukri is clearly a complete pervert, but this is presented in a very comical way, since in the end the girls will get the best of him. The girls have a lot of hilarious victory lines that range from them making fun of each others outfits to making references to things from the other King of Fighters games. If you change the girls’ voice options in the customization menu it will change their victory lines a bit. I thought this was a nice touch and added a bit more to the customization aspect of the game. Each set of girls has a unique story prologue and boss scene, and there are some pretty funny quips in these as well. Graphically the game looks great. The characters are colorful and their costume designs are well thought out. What I mean by that is that the story takes place in a world that Kukri controls, so he put the girls in clothes that match his fetishes. I personally think all of these designs look great, and if you’re not a fan of these then don’t worry because their standard costumes are one of the three that can be unlocked in the customization shop. 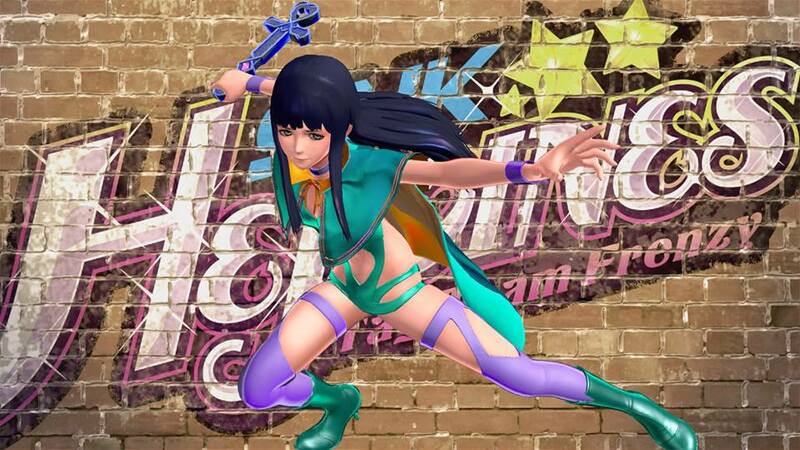 The costumes have four different color schemes as well. There are plenty of fancy special moves that send random objects flying about. These include many food items and even a Fatal Fury arcade cabinet! SNK Heroines: Tag Team Frenzy runs at steady 30 FPS on the PlayStation 4 and I never saw a single dip anywhere. The music here is kind of a mixed bag. I didn’t think there was anything that special about the stage music. There’s nothing wrong with it, but nothing that really made it stand out either. I was pretty happy they included remixes of all the girl’s original themes. These play in the customization menu for each girl and you can even set them for the menu music. The opening and ending themes are both very nice with a great beat and some awesome Japanese vocals. The mechanics in this game are very simple, just like they said in EVERY INTERVIEW leading up to this release. You have a weak and strong attack. Hitting these buttons in a certain order will give you a combo. The circle button will perform special moves. Each girl has a few of these in their arsenal and all you have to do is press a single direction to choose which move the girl will perform. There are some of these that can be chained together and a few can be done in mid air as well. You can also tag out in the middle of a combo so your partner can get in some licks as well. If you time this right you can pull of some pretty impressive multi-hit combos. The bar at the top of the screen is of course your health bar like in any standard fighting game, but things are a little different here. You will notice that part of it is colored in a sparkly pink color and the rest of it is green. The green section of the bar is your actual health. The two girls share this one section of health so tagging out will not restore any of it. The pink portion of the bar is spirit meter. When this meter is filled to a certain point you can unleash one of these powerful finishing moves. Each girl has two of these and they are done by simply hitting R1 on the controller or pressing down and R1. A match can only end when your opponent’s health bar is depleted to a certain level and you hit them with a Dream Finisher. A gong will sound and Finish Chance will appear on screen when any players health is low enough to finish them off. What makes this very interesting is that as you lose your health, your special bar gets longer. This means when you have low health you can pull off more than one finisher in a row. This certainly gives opportunities for last minute comebacks. At first I thought having to end each match with a Dream Finisher would be a huge pain. I figured the CPU would just always block these and it would be an endless cycle of “well crap I miss, so let’s wait for this to charge up again”. This isn’t really the case however, since when an enemy’s life bar is completely depleted they will become stunned very easily allowing you to basically finish them off at will. It also helps that while you do share health with your partner, you do not share a spirit meter. This makes it easy to tag out and finish off your foe quickly. The last gameplay related item I would like to discuss are the items found in battle. Yeah, I thought this was a Smash Bros. only thing but I was very wrong! During matches glowing orbs will appear on the stage. If you punch these you will be given various combat items. These items have a range of effects, some will give you damage buffs, restore some health, drop wash pans on foe’s head, plant springs that shoot your foe in the air, encase them in sand and much more. You can set how often these items appear in battle and they can sway a battle in your favor if you get the right one at the proper time. These are a silly addition to an already crazy game, and I thought it made it even better! The one area were this one really suffers is the single player content. While there is a ton of customization pieces to unlock with in-game money, there’s not much else. Though I will say I had a lot of fun decking out the girls in crazy gear. There are three save slots to save your decked out beauties in as well. I spent about 10 hours and had unlocked all of the gallery items, costumes and accessories. Though I would be lying if I said I didn’t spend an hour or two messing around with the photo mode in the customization menu. 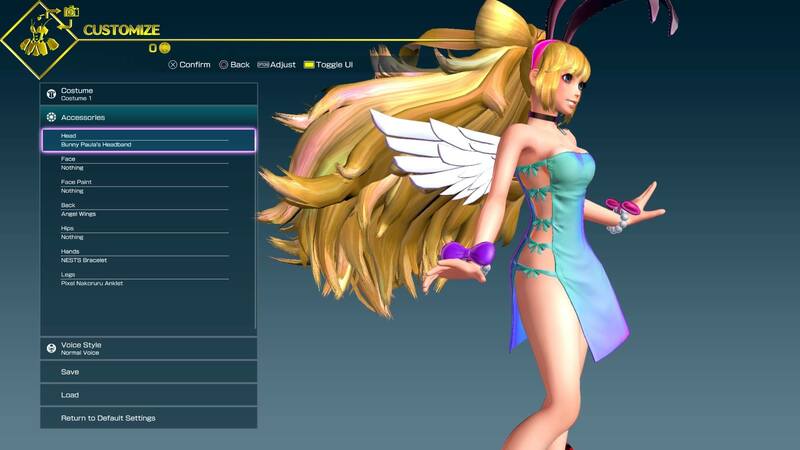 You can choose several different poses for each girl, choose from a ton of different backgrounds and even use this mode to set up a custom avatar for the game. In addition to story mode there is a versus and a survival mode, but I feel like if they had thrown in a few more modes or mini games this would’ve fleshed everything out a whole lot more. There are five different difficulty levels that can be changed at any time during the game, so this does add some more replay value. 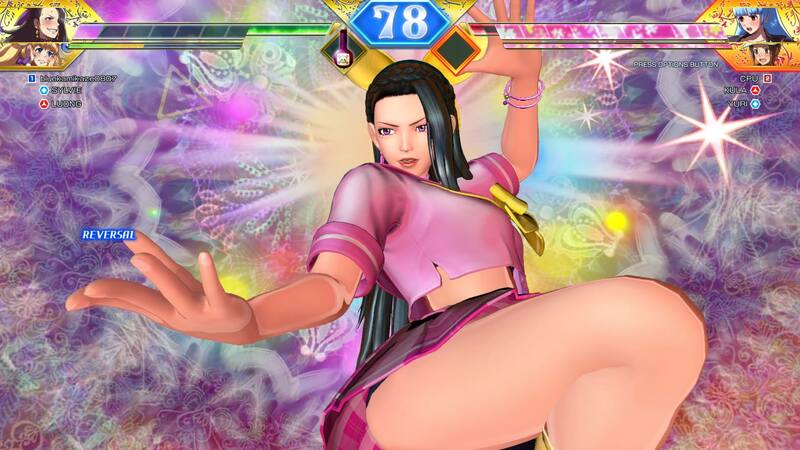 SNK Heroines: Tag Team Frenzy does exactly what it sets out to do. 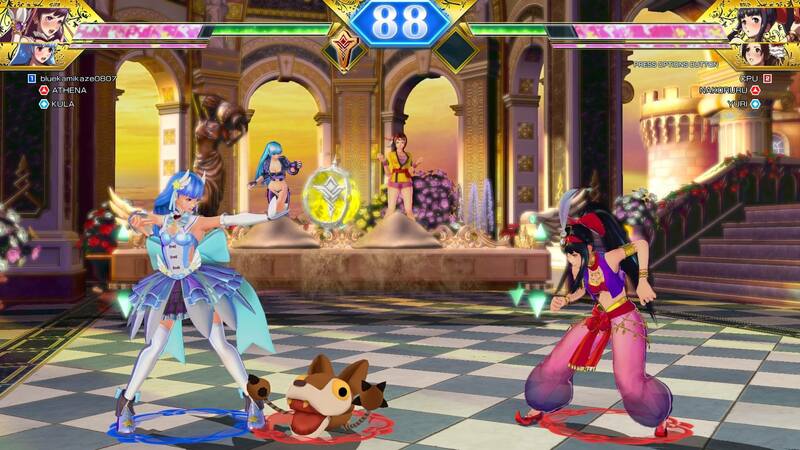 It provides a fan service filled, over the top fighter anyone can pick up and play. This is pretty much what I expected this title to be from the day that they announced it. 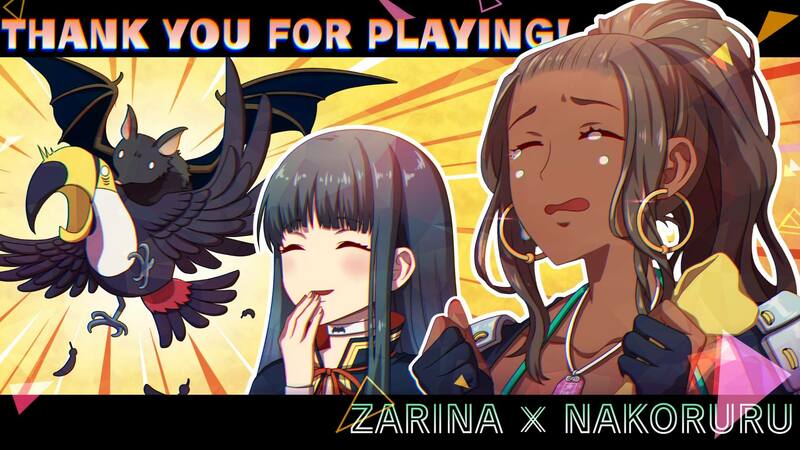 I thought the girls’ outfits were all outstanding and I really had a good time playing through the crazy story with each set of girls. I do think this one is a little light on content. A few more gameplay modes or some other extras wouldn’t have hurt this one a bit. If you are an SNK fan and you want to see some of the leading ladies in a very unusual environment, then this one is well worth the $49.99 price tag. I think casual fighting fans would have a great time with this one as well, since it is really easy just to pick up and play. In the end this may be for the casual fighting fan, but I still feel that it’s better than your average anime fighter!